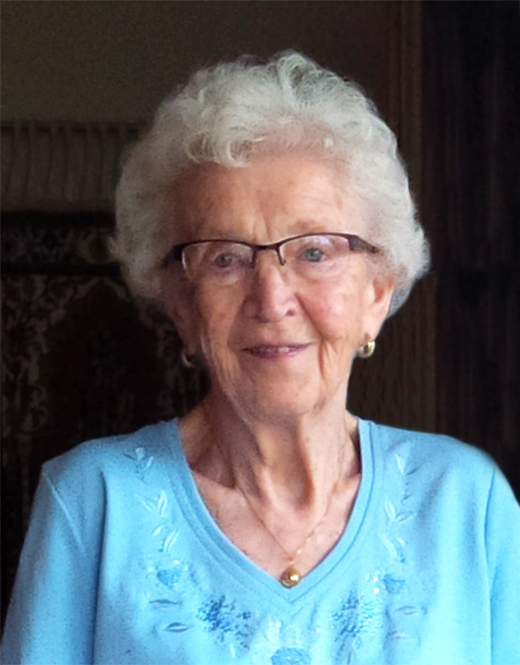 After a brief illness, Linie (Krahn) Friesen, age 97, passed away on April 11th, in the beautiful hospice room of the Altona Community Memorial Hospital, surrounded by family. She is survived by her three sons: Eric (Susan) of Amherst Island, Ontario; Paul (Val Carter) of Winnipeg, and Tim (Pam) of Altona, as well as 6 grandchildren, 14 great grandchildren, and 4 great great grandchildren. She was predeceased by her husband, Ted Friesen, on February 15th, 2016. Linie was born, Lina Krahn, on August 22nd, 1921, in the Mennonite village of Grigorievka, South Russia. She was the eldest child of Peter B. and Justina Krahn. In 1928, Linie, along with her parents and three sisters, emigrated to Canada and settled in southern Manitoba, where her father would continue the teaching career he began in Russia. Three brothers would be born in Canada. Linie was predeceased by her sisters Herta, Susan and Frieda, and her brothers George and Ernie. Only brother Henry Krahn survives. After graduating from the MCI in Gretna, Linie went to Normal School, and inspired by her father, taught for 5 years in the one room school in the village of Kronsthal, a few miles southwest of Altona. It was during this time that she met the love of her life, Ted Friesen, one of the sons active in the printing and wholesale stationery business in Altona. They were married on September 23rd, 1945 in the Altona Bergthaler Church, and remained anchored in Altona for the rest of their lives. Linie was active in so many aspects of Altona life. She was an excellent soprano and loved to sing, becoming one of the founding members of the Southern Manitoba Choral Society and a regular in the Altona Mennonite Church Choir. Linie would continue to sing well into her 90’s. She and Ted spent a lifetime of attending concerts in Manitoba but also across Canada, the US and Europe. Speaking of travelling, though they always had an Altona address, Linie and Ted loved to travel, by car, cruise ship and air. Few opera houses, concert halls, art museums or famous churches were missed by them in their many decades of travelling. They made friends throughout the world and stayed in touch with them. Linie was a woman of deep and abiding faith. She was baptized into the Altona Bergthaler Church, and later joined her husband Ted as founding members of the Altona Mennonite Church, in which she was active for the rest of her life. One of her lasting contributions was the founding in March of 1972 of the very first MCC Thrift Shop in Altona. Linie, along with three friends, Selma Loewen, Sara Stoesz and Susan Giesbrecht, had a vision for how a thrift shop could contribute to the international work of the Mennonite Central Committee. What began in a small shop in Altona in 1972 has now spread to over 100 thrift shops across North America, with an annual income of more than 16 million dollars. Linie and her three friends were honoured by MCC on the 35th anniversary of the thrift shops founding, and at least once more after that. Linie was also instrumental, along with her friend Anne Berg, in establishing a public library in Altona. She and Anne successfully convinced both the Town of Altona and the RM of Rhineland of a library’s virtues. She was at one time a President of the Altona Women’s Institute and the Manitoba Mennonite Women’s Organization. And like her Friesen sisters-in-law, she was a crucial support person for her husband as Ted and his brothers established and developed Friesen’s, now one of the preeminent printing companies in North America. Unlike the Friesens, most of whom remained in Altona, Linie’s siblings were scattered across the world. So it was she, as the eldest and the one most permanently anchored to Southern Manitoba, who would be the focal point for regular Krahn reunions in Altona. She was also the caregiver to her mother, Justina Krahn, in the latter years of her life. Linie and Ted were among the first to sign up for a seniors condominium in the new Gardens on Tenth complex in Altona. They both enjoyed the spacious and sun-filled two-bed condo they moved into in June, 2015, and celebrated their 70th wedding anniversary there in September of that year. Linie was able to remain there until just a few months before her death. Linie was a founder, a builder, a leader and always an active participant in the life of her church, her community and the family she loved. She was in turn much loved by a wide circle of family and friends all over the world, and will be much missed. The family wishes to thank Dr. Moab Basta and the staff of the Altona Community Memorial Health Centre, as well as Southern Health Home Care for the wonderful care given to Linie over the last few years and especially these last few weeks. A celebration of Linie’s life will be held on Tuesday, April 16 at 2:00 p.m. at Seeds Church, Altona (116 Main Street, Altona, MB). Viewing will be held at Wiebe Funeral Home Altona on Sunday, April 14 from 1:00 – 9:00 p.m. In lieu of flowers, the family encourages contributions in memory of Linie Friesen to MCC, MCI or Altona and District Palliative Care.